Both Carlton and 505 Dundas were converted to full bus operation in mid-February 2018 to deal both with the shortage of streetcars and with numerous construction projects affecting both routes. 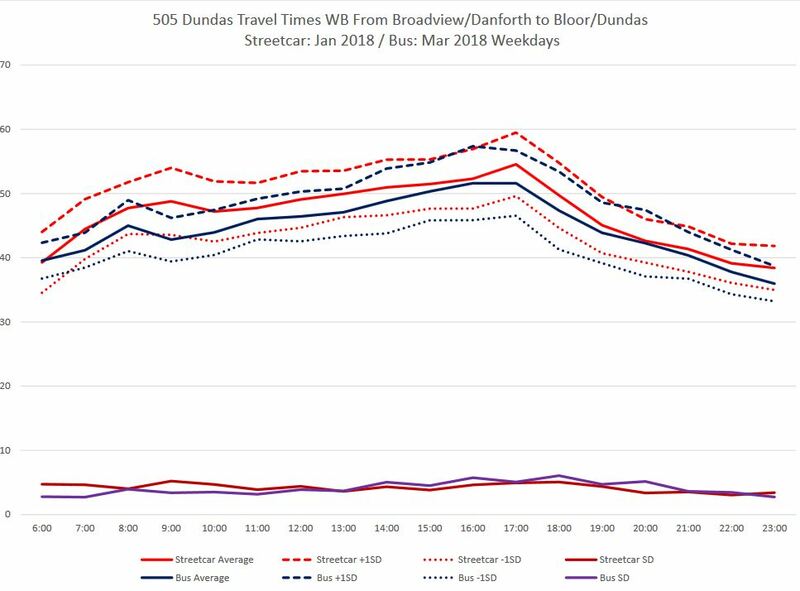 This article deals with travel times on the 505 Dundas route. Part II will review headway reliability (the spacing between streetcars or buses). January 2017: 505 Dundas operated with streetcars on the standard routing. April 23, 2017: Water main and track construction on Dundas between Yonge and Church required a diversion via Bay, College/Carlton and Church both ways. May 15, 2017: Diversion revised to Bay, College/Carlton, Parliament and Gerrard both ways. June 5, 2017: Diversion reverted to Church Street routing. August 18, 2017: Service resumed its normal routing. November 26, 2017: Peak period bus trippers scheduled to operate on 504 King (7 AM, 2 PM) were switched to 505 Dundas in exchange for streetcars. February 18, 2018: Route converted to bus operation. The first set of travel time comparisons mirror a chart created for Part III of the Carlton review. 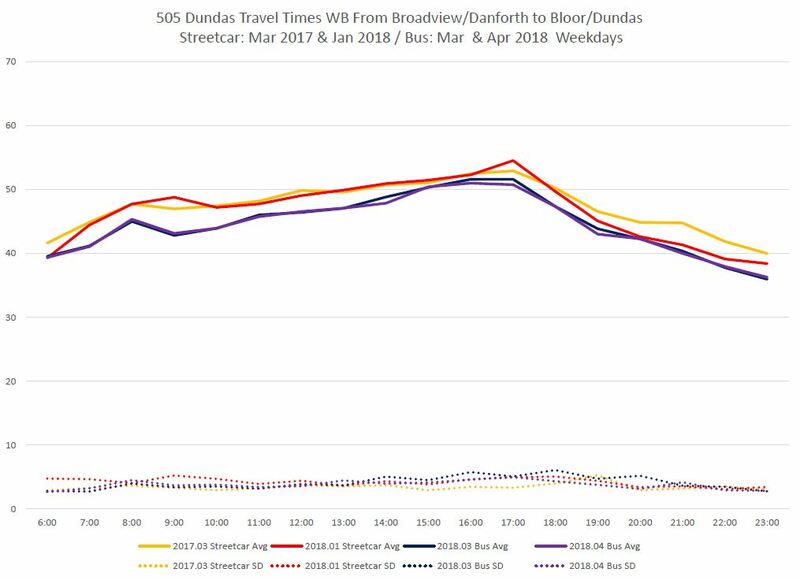 This shows the average travel times for streetcars in January 2018 versus buses in March 2018 between Broadview/Danforth and Dundas/Bloor. 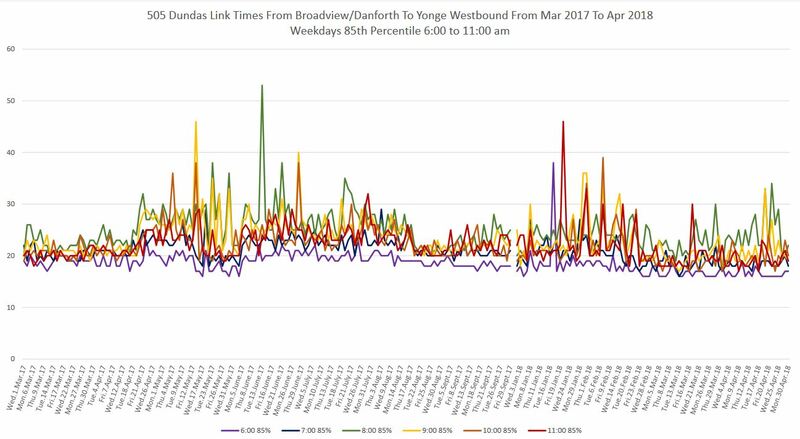 Time spent north of Danforth/Bloor is not included so that variations in terminal delays and layovers do not affect the measurements. Average travel time for all weekdays by hour. Solid line in the group at the top of the chart. Standard deviation of travel time values. Solid lines (in dark red and purple) at the bottom of the chart. Average values plus one standard deviation. Dashed lines. Average values minus one standard deviation. Dotted lines. The premise of this is that about two thirds of all trips will occur between the lines marking ±1 standard deviation. Although the streetcar values are higher than buses for westbound weekday trips during much of the day, the situation is not the same for eastbound trips nor for weekend travel. The full set of six charts (one for each direction, one each for weekdays, Saturdays and Sundays) is linked in the PDF under the chart below. The streetcar data are shown in yellow (March 2017) and red (January 2018), while the bus data are in blue (March 2018) and purple (April 2018). For westbound weekday trips, the streetcar values are generally a few minutes higher than the bus values. However, the eastbound values are not as the two charts below show. For eastbound, the values in January 2018 are higher, but the March 2017 streetcar values are comparable to the bus values. Westbound trips on Saturdays show overlapping values for the four months and two modes. The point here is not to make a definitive conclusion, but to illustrate that the data values do vary, even for the same mode, and that small differences in comparing the modes may lie within the normal range of values rather than being a meaningful difference. This is a topic for another day with an even larger collection of data. The full set of six charts is linked as a PDF following the illustrations below. For the purpose of analyzing the GPS-based vehicle location data, the route is subdivided into 10m segments. The location of each vehicle is updated every 20 seconds, and this allows calculation of its velocity at its current location and time. These values are averaged to produce a velocity for every 10m route segment, subdivided by hour of the day to show the evolution of data values. 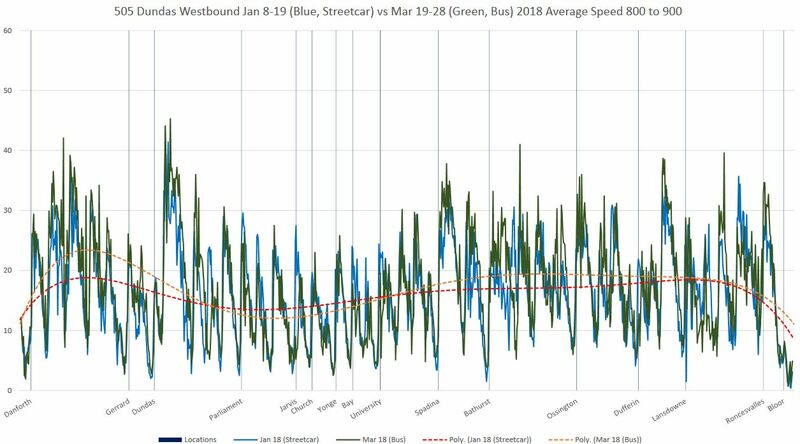 The sample chart below shows westbound operations for streetcars and buses over a roughly two-week period in January and March respectively in the 8-9 am hour. The date ranges were chosen to avoid major disruptions (storms) and lighter than usual traffic days when schools were not in session (post New Year’s Day, March break). These are the same dates used in the Carlton analysis. The blue line shows streetcar values while the green line shows buses. Trend lines are interpolated through the data to show the broad pattern. Buses are faster in some places, while streetcars do better in others, notably the downtown area which is congested and where vehicle loads are greatest. In some cases where buses make better speed than streetcars (notably between Parliament and Broadview), they do so by driving on average at greater than the 40 kph speed limit. Bus operators have vehicles with faster acceleration (when not heavily loaded) and they tend to drive more aggressively than streetcar operators. 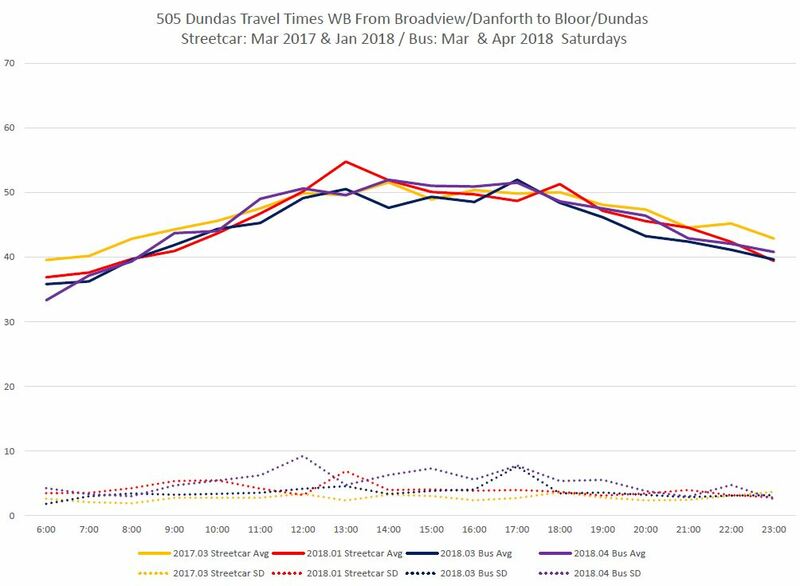 Note: In the charts that follow, there is no data for the months of October to December 2017 because I was not collecting 505 Dundas data for that period. This set of charts presents the percentile values for travel times in two different ways. The first format shows these values on an hourly basis, and these are spread over three pages covering the morning, afternoon and evening hours for clarity. The 85th percentile charts show the maximum travel time experienced by most trips, but with the outliers (the top 15%) omitted. The 50th percentile charts show the median travel time for all trips. This is the value for which half of the trips were longer, and half were shorter. The sample below shows the 85th percentile values for the morning data. It is no surprise that the values for the 6-7 am hour (purple) are the lowest, and the 8-9 am hour (green) is the highest a good deal of the time, although midday values sometimes overtake it. Comments on the specifics of each period and section of the route are included with the links to each set of charts below. The second chart format presents four percentiles for specific hours through the day: AM peak, early afternoon, PM peak and early evening. 25th percentile (purple): Only one quarter of the trips are made in this time or less, and this is a lower bound on what most riders experience. 50th percentile (green): Half of the trips are faster than these values, half are slower. 85th percentile (orange): Most riders will experience trips no longer than this value. 100th percentile (red): These are the maximum travel times. Most trips will be made in the 25-85th percentile range, and to the degree that the purple and orange lines are close to each other, most riders will see a consistent journey time. For both directions and halves of the route, the effect of the diversions is clear in changing travel times. In the chart above (taken from page 7 of the first set linked below), there is a jump in values starting in mid-April as the diversion around construction begins. This added extra mileage plus turns as cars had to travel off route to reach Yonge and College rather than Yonge and Dundas. The exception to this was the period when service operated from Broadview to Yonge via the 506 Carlton route, a shorter trip than going via Dundas.. 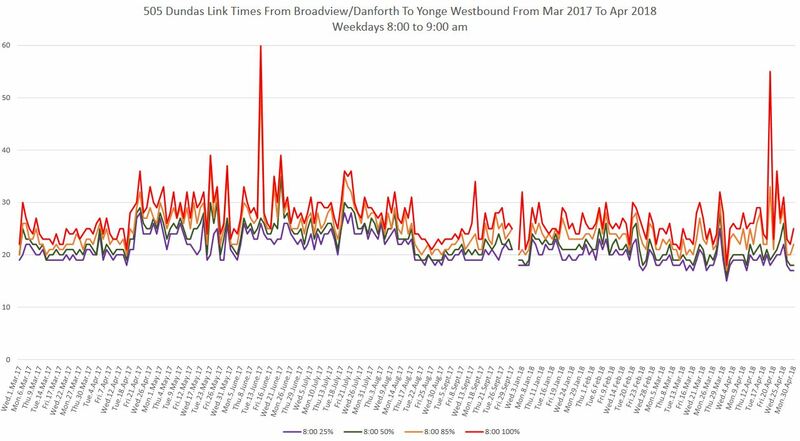 Westbound from Broadview to Yonge, the 85th percentile values show both the effect of the diversion from April to August 2017, and also the change with bus operation from mid-February 2018 onward. This section and direction of the route has the largest difference between bus and streetcar running times due to faster bus operation between Danforth and Parliament. That difference is most striking in the afternoon, although it is worth noting that streetcar travel times in early 2017 are not much higher than bus travel times in 2018. Another point worth noting is the “spikiness” of the values during the period of the diversion. 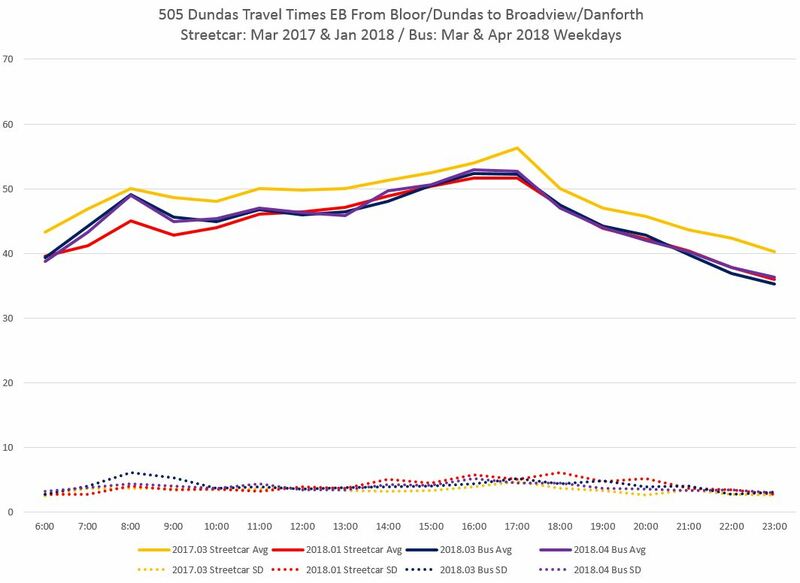 The 50th percentile values do not bounce around as much, and show especially in the afternoon data (page 5) the change in travel times for each period of the route’s operation. Westbound from Yonge to Bloor/Dundas, there was no change in the route during the diversion period and so the travel times are consistent over the period. This end of the route showed less difference in travel times between buses and streetcars, and this is reflected in the smaller change from mid-February 2018 onward. Note in particular that the March-April streetcar travel times before the onset of the diversion are similar to the bus travel times in 2018. As with the westbound travel, the eastbound data for the western half of the route show the effect of the diversion, but also shows similar bus and streetcar travel times. Eastbound data for the eastern half of the route show slightly shorter trips for buses versus streetcars, but not to the same degree as for westbound trips. Buses instead of streetcars. I avoid the 505 or 506 routes. Wonder if others do the same? Clarification. Would return once the streetcars return to the 505 and 506. The entire Ford family sees bus and subway transit as the constant panacea. I can see subways as reasonable when there is $$$ for them. That isn’t presently the case. Bus ‘transit’ advocates MUST always limo. Aside from easy shifting of routes [which would only be an advantage in cities with very poor short term planning – and there’s only one of those in all of Canada] a bus has no advantage over trolleys and LRTs. It’s a horrible place with a lurching ride and no space. If the guy in front of you has recently barfed, you’ll know it sooner on a bus. It will also happen sooner on a bus and he can do it without drinking! So Doug, take the whole family out of the Escalade, and rub shoulders, elbows, and practically everything with your ‘future constituents’. It’ll make a man out of you. When switching from bus-trips to rider-trips, you have to go carefully. Your data is on bus-trips. Those fast buses at 3AM probably have two passengers on them. And the slow buses at 8:30AM probably have 60 people on them. So in fact passengers are a heckuva lot more likely to routinely hit 85th percentile and 100th percentile travel times than BUSES are. 85th percentile is what most passengers view as “normal”, what they experience every day. Steve: The values vary over the day, and from day to day, as the charts show. There is no 3am data here, and the chart immediately following your citation is for the am peak hour. These are travel times over a portion of the route, and individual experience will vary depending on which route segment someone is using. Another major factor in rider experience is the wait time and crowding to which I will turn in Part II of this series. I agree that wait times should be weighted based on actual usage, but when the stats are all for the same time of day, as on that chart, it is reasonable to assume that the only fluctuation in demand will be a long seasonal shift. In past work, which is largely not published because I am not happy with how the results behave, I have attempted to calculated a “weighted wait time” that takes into account the fact that when service is bunched, more people will be jammed onto the buses carrying the wider headway while others run half-empty behind. If one assumes a uniform arrival rate of passengers at stops (and this is not necessarily valid especially at transfer points), then the weighted values are better related to the square of the headways (more passengers accumulate and their wait times are longer). The problem with this is that it becomes an abstract value. It is a lot easier to demonstrate what is going on with the 85th percentile (the high end of what most riders see) and the 25th percentile (a speed or wait time, as the case may be, that most riders will not experience). For wait times, these extremes show the range of values and especially show the degree to which, for headways, service is bunched with a lot of wide headways as well as a lot of short ones. Similarly, if the two lines (85th and 25th) spread apart for travel times, this shows that something is causing a degree of unreliability in travel speeds. The effect could be over the whole route or concentrated in certain locations, but in the interests of space and reader fatigue I have not included charts at that level of detail (although I do have them). In general, looking at years of data on many routes, the variation is much greater in headway reliability (wait time) than in travel speed, although improving speed reliability can assist in line management and affect the headways. Only because they don’t actually care about transit – they care about it taking up road space and interfering with car traffic. They don’t mind buses because they just think of them as “big cars” – they behave the same way in traffic as cars more or less, unlike streetcars. Subways they like because they think they were built to get transit out of the way of drivers, not realizing it’s the other way around – they were built to get drivers and pedestrians out of transit’s way. Lived experience is that I’ve been finding the bus to be more frequent, which has been a plus. But crowding has been an issue especially heading westbound in the P.M. but there is usually an emptier bus not far behind. Only a couple of occasions, where the headway has been terrible (i.e. I’ve walked up to College because the next three buses were coming for another 23 minutes). One thing I’ve especially disliked is being stuck behind these things on the days I bike. The exhaust and noises when the buses accelerate are literately nauseating. Can’t wait for the electric bus fleet. Interesting you mentioned the Dundas buses speeding between Parliament and Broadview. I think it could be even further back, like Sherbourne, especially later at night. Numerous times after 11 I have seen buses miss the Ontario stop because they are driving too fast and not paying attention and one trip 2 weeks ago the driver missed both Parliament and Ontario. It’s ridiculous and the TTC needs to do something about it.